I stood at the front door and yelled. ” Avengers Assemble!” Captain America and Spider-man came running at me and then through me out the door, to the car and they hopped in. One quick picture and we were off to see Marvel Universe Live at the Canadian Tire Centre and all their favourite super heroes up close and personal. My boys 4 and 6 were excited to see a live action Marvel show since they are too young for the movies and I was excited to see an Avengers team that finally includes Spider-man and Wolverine. Parking was easy but bypassing the overpriced merchandise stands every 25ft on the way to our seats was not. Constantly telling two excited boys that we are not buying any of the lit up flashing toys because it costs way too much was frustrating. I had to buy them popcorn as I had promised them earlier in the week I would and it cost me $30 ($15 each with a cheap Marvel bag). There were lots of kids dressed up as their favourite super heroes and dads like me wearing Marvel character t-shirts and you could feel the excitement in the air. 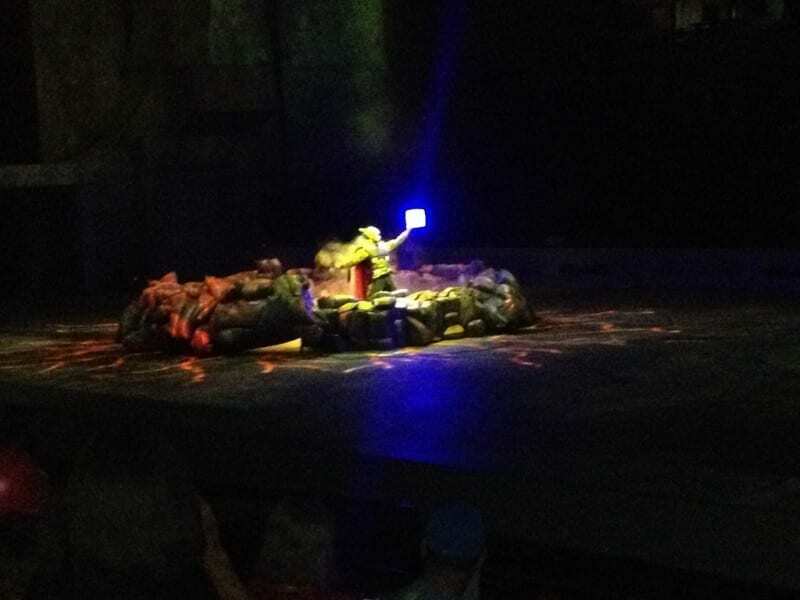 The show started with a bang that made everyone jump out of their seats, with the cosmic cube being smashed with Thor’s hammer. This led to Loki (pictured below) with Red Skull Madam Hydra, Killain Albrich, Green Goblin, Electro, Rhino, Doc Oc, Lizard and Black Cat starting trouble again here on Earth and the need for the Avengers – Iron Man, Spider-man, Captain America, Thor, Ms Marvel, Hawkeye, Agent Maria Hill, Nick Fury, Storm, Cyclops, Black Widow, Falcon, Bruce Banner (Hulk) and Wolverine to assemble in order to stop him. The first half of the show sets up the plot and brings together all the avengers and assigning them their missions and villains they will have to take on in the second half. The second half of the show is non stop action with amazing set pieces including the Statue of Liberty right inside the Canadian Tire Centre. There was a gigantic backdrop screen which uses projection-mapping technology to transform scenes from Tony Stark’s laboratory, AIM’s factory, Loki’s base in the Himalayas and more. It enabled them to show Iron Man’s suit to “fly” onto his body and for Wolverine and Hulk to get caught in an avalanche while climbing to Loki’s base. The boys were in awe of the awesome stunts involving wire work, motorcycles, car chases and the choreographed fighting. There were also lots of explosions, smoke and even Killian Aldrich (pictured below) on fire fighting Iron Man. Of course this all led to the big show down with all the villains and all the Avengers battling out in Loki’s base. My boys kept asking when will the Hulk show up through out the show and I kept telling them to wait because I had a feeling they would save the best for last …and I was right. When Hulk showed up everyone in the audience cheered as he smashed his way into the show. I have to say I really enjoyed the show and I know my boys did as well, it was fun and exciting to experience the action live. If you or your kids love super heroes I recommend checking out Marvel Universe Live! For more information, you can follow them on Facebook, Twitter, Instagram and YouTube! Looks like a fun show! Love that there are more options beyond Disney nowadays…. Seeing Marvel live would be amazing. I think the adults would enjoy it just as much. I know my guys would die to have gone. It sounds like it was a great show! My little guys would love this show. Too bad it doesn’t play locally. Oooo I wish we had a Marvels Universe playing here! No luck, closest one would be in Toronto. Im glad to hear it was such a blast! My little cousins saw this too and absolutely loved it. Super fun! I love going to shows like this! Marvel live would be amazing,wow! « Buying and Selling Items Made Easy with VarageSale!